Few people have contributed more to the Western New York sports landscape than Benjamin “Benjy” Bluman. Over a career that spans six decades and three sports, Bluman has excelled in every role he’s played, and accumulated a multitude of awards and honors, not only for his athletic achievements, but for his service to the athletic community as well. Born in Buffalo, Bluman’s storied career began in the 60’s at Riverside High School where he was a three-year star on both the varsity basketball and baseball teams. His athletic gifts were on full display when, as a senior, he led the Yale Cup in scoring, and was named to the All-High teams in both basketball and baseball. After graduating from Riverside in 1963, Bluman continued his career as a two-sport athlete at Buffalo State College where he played varsity basketball for three seasons and varsity baseball for two. As the co-captain of the basketball team, he led the Bengals to a 19 – 4 record and a spot in the NCAA College Division Tournament while being named All-SUNYAC second team. Bluman’s team was the first in Buffalo State College history to go undefeated in league play. For his accomplishments, Bluman received Buffalo State’s Hube Coyer Outstanding Senior Athlete Award before graduating in 1967. Bluman returned to the diamond after college and joined the Plant 6 slo-pitch softball team. Throughout his 12 year career he patrolled the infield as a standout shortstop playing more than 140 games per season all across the United States. In a testament to his exceptional play, he was named back-to-back Slo-Pitch Player of the Year in 1979 and 1980. During this time he also began what would become a long and illustrious career as a basketball official. In 1974 he joined the International Association of Approved Basketball Officials (IAABO) as a Western New York high school basketball official, and ten years later he joined the Collegiate Basketball Officials Association (CBOA). A familiar face in Western New York High School basketball circles, Bluman has been an IAABO official for 42 years, serving on the board for the last 25 and as the President since 2002. He served as the CBOA area rep for 10 years and was presented with the John Nucatola Award for distinguished service to collegiate basketball in 2010. He has been selected to officiate at the state basketball finals in Glens Falls five times. For his lifetime of athletic achievement and service, Bluman has been inducted into the Buffalo State Athletics Hall of Fame, the Western New York Softball Hall of Fame, the Jewish Center Sports Wall of Fame, and the WNY Officials Hall of Fame. 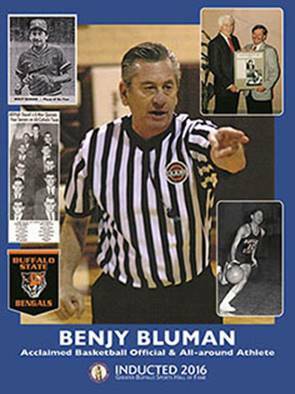 Bluman can still be found roaming the court in his familiar black and white stripes at local high school and collegiate basketball games. He, and his wife of 48 years, Laurie, and their children Josh and Kory, still live in Buffalo where Bluman has enjoyed a successful banking career.